If there was ever any doubt about the power of fashion in Hollywood, all rumours were put safely to bed after an almost eight-hour marathon of mode. The Red Carpet, the Oscars’ broadcast, the party frocks post-show…it’s an endless parade of designs and designers that have become ubiquitous even for those of you who weren’t born with a Vogue subscription. We are all used to the “who are you wearing” question on the carpet – many of us watch only for that reason. However, this year a line was crossed – in branded shoes. There was no tip-toeing about it. Along with the entourage that celebs thank in their speeches, there were two notable fashion designer mentions. Natalie Portman, accepting the Golden Man for her Best Actress role in Black Swan, thanked Kate and Laura Mulleavy of Rodarte, for the smattering of dresses they created for the film. Portman accepting her award, wearing a custom-designed Rodarte gown. When so many actors are contractually tied to a fashion house, Portman’s words seemed heartfelt (she is friends with the sartorial sisters). Colin Firth, who never has far to reach for an eloquent word or few, emoted similarly of his friendship with Tom Ford. Firth gave one of the loveliest speeches of the night. 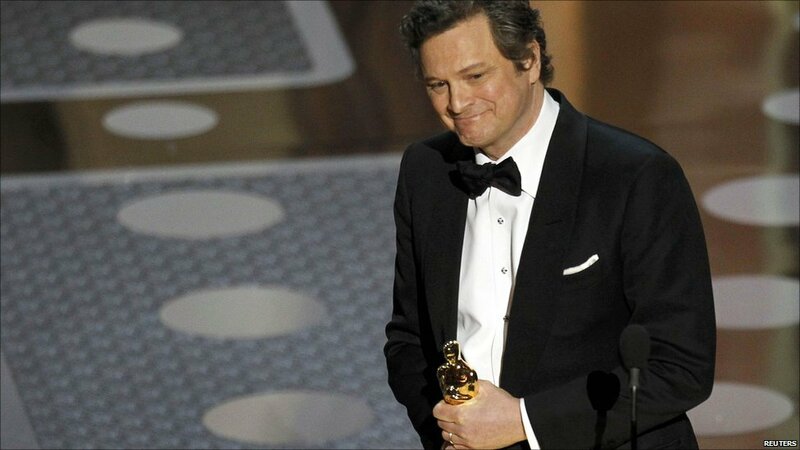 The diamond studs on his shirt couldn’t out-sparkle the brilliance emanating from Firth, as he accepted his win for Best Actor in The King’s Speech. Colin with wife, Livia on the Red Carpet. And while Anne Hathaway wore numerous dresses on stage, she repeated this Versace gown at the after-party, saying she felt “it didn’t get enough air time”. The perfect colour for the stage vs. the red carpet. That sound you hear? It’s celeb phones ringing off the hook for next year’s couture circus. This isn’t the first time Colin and Livia or Natalie have shone on the red runway. Image credits: BBC, BBC, NDTV, The Star Ledger.